I was noticing that orbs are everywhere and for good reason; can there really be a better shape!? 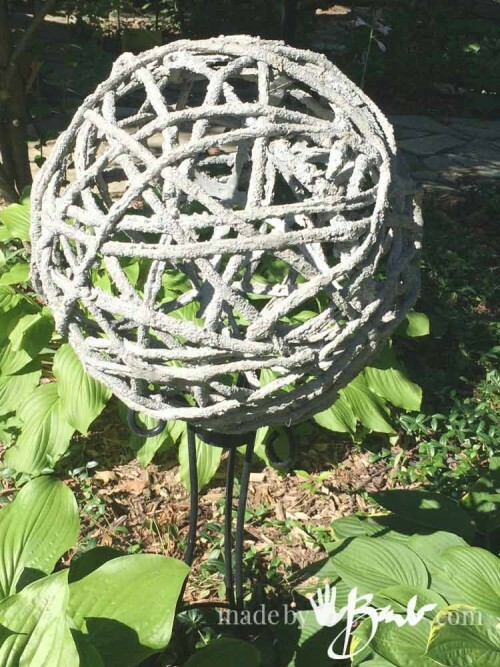 So that got me thinking in my ‘concrete ways’… I knew concrete spheres can be poured but how could I change it up a bit? 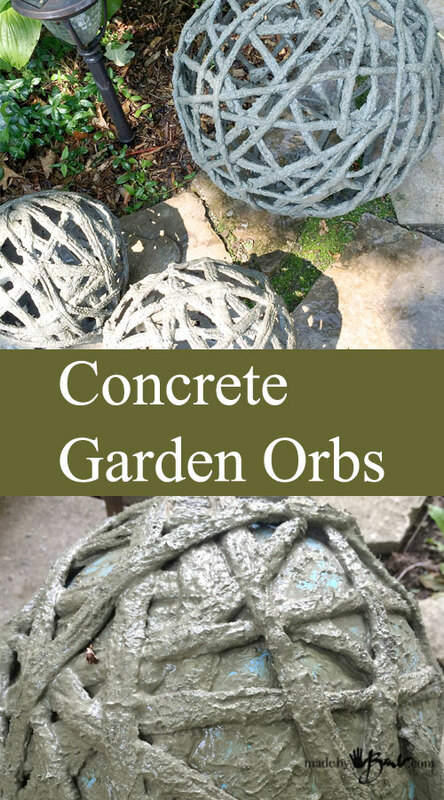 Here are my DIY Concrete Garden Orbs inspired by draping methods but my own original exclusive design. These are not solid, don’t require fancy molds and are so easy to make! 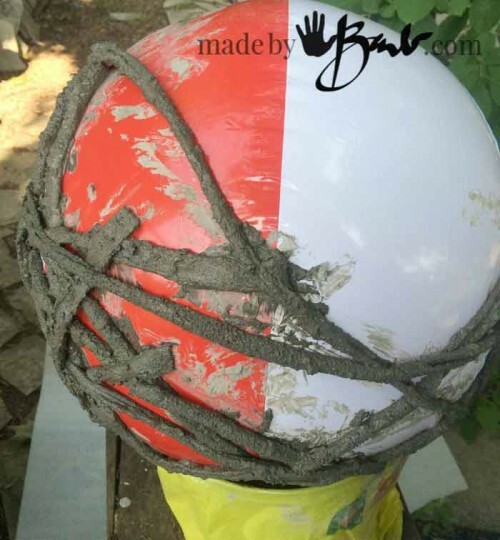 The first large concrete garden sphere is made with a large beach ball and some polar fleece fabric that I had on hand. I have a lot on hand, fabrics, yarns etc. I employed the rotary cutter to get that job of strip cutting done faster. The pieces were not a continuous string, but that was ok. Either would work. The pieces were cut ½” wide. The whole principle is similar to any concrete work. 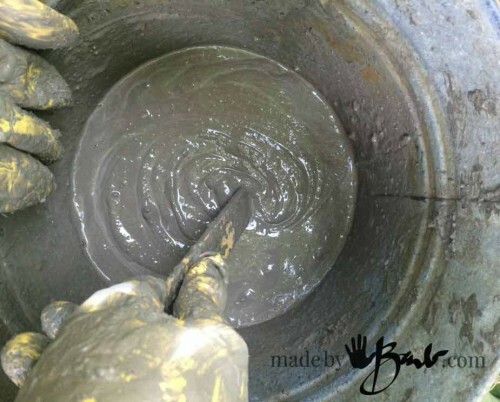 The Portland cement is the ‘active’ part of most concrete mixes. The mixes do however also contain gravel and sand. In this recipe the sand and gravel is replaced by the fibrous yarn or fleece. 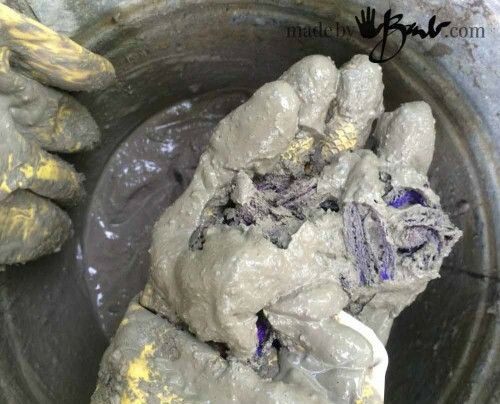 The portland cement is meant to get into the fabric and once cured will create a very stiff shape. 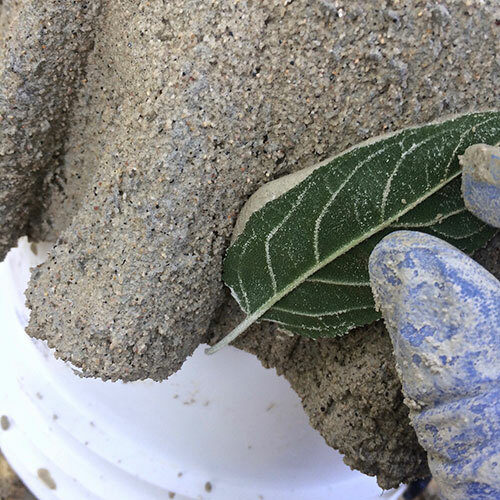 My concrete Leaf stepping stones here are made of a mix that already includes sand as the material with the Portland cement. 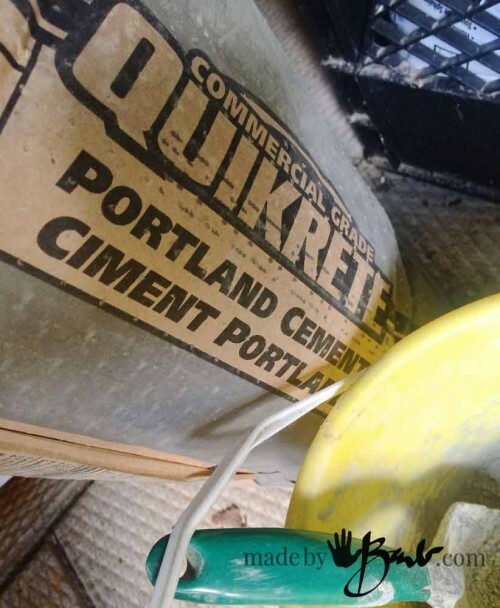 Do be aware that Portland Cement does have an expiration date and will lose it’s strength. The downside of Portland cement; it weighs A TON! It is a bit pricier, but you usually don’t use it by itself, so it can go a long way. Mixing this recipe is a little different since there is no sand or gravel. It will be creamier and almost like melted ice cream. A pudding texture is too dry, as the fabric will pull out some of the water as well. You can dampen the fabric or yarn to aid in the absorption of the cement. Concrete is pretty patient, but sitting too long will start to set it. Plus, take my advice, once you get your hands in there, you can’t touch other things. Plop the fabric into the slurry, squeeze and make sure it gets into the fibre. That is key to the strength. There shouldn’t be any air left in the fabric. You also want to keep track of an end, especially if it’s one long piece, because it may be impossible to find later! 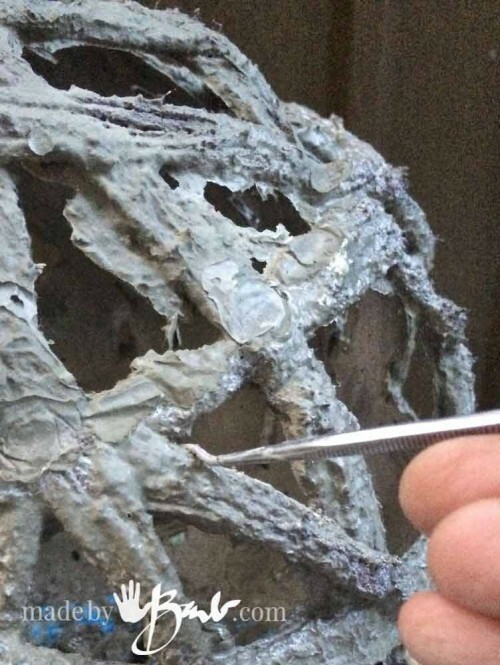 Here’s the tough part: we only have 2 hands, so wrapping and running the strip through fingers to remove the excess cement becomes a challenge. In my case I worked on the large ball one half at a time. Once the first was relatively hard I turned it to the bottom and incorporated the top half. The ends were wrapped or just hidden under another piece. Try to criss-cross to make a random pattern with similar size spaces. I was surprised that it ended with the strength it has. If need be a second layer can be added once the first one has set enough. The large size makes it more difficult than a smaller size. Here it is, waiting to cure. The polar fleece curves nicely when somewhat stretched. The concrete texture camouflages the fabric and resembles grapevines. Fleece strips and addition of the top of sphere. Here you see balloons for the smaller forms, also resting on some buckets/pots. In this case I again found some yarn that was quite “chunky”. I wanted even more thickness, so I tied it in double strand every 12” or so. I believe it was dollar store yarn. The fuzzier and fatter – the better. Again, mushed into the slurry of portland cement. 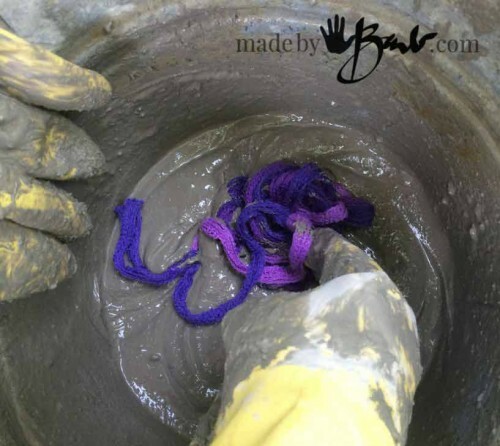 Squeeze the cement into the yarn. Add water if needed, only a smidgen at a time. Since this was yarn, it was longer and allowed me to just pull up as I turned the balloon above the bucket to wrap back and forth. Smooth the excess off or run through fingers. You WILL be covered in concrete at some point, so don’t wear your best clothes. I do now have concrete stains on my camera. The amount of wrapping and coverage on these is more dense, so I’d say they are stronger. But who really sits or stomps on these anyways?! 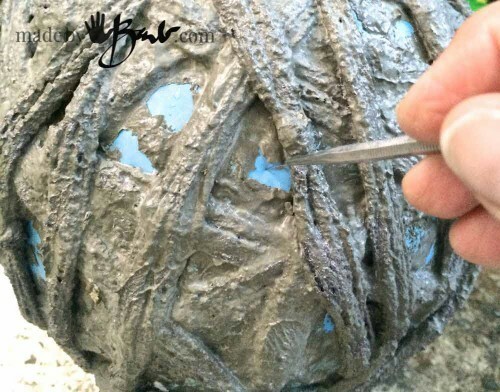 Spray the orbs with water to strengthen the concrete during curing. Don’t rush, they will cure. 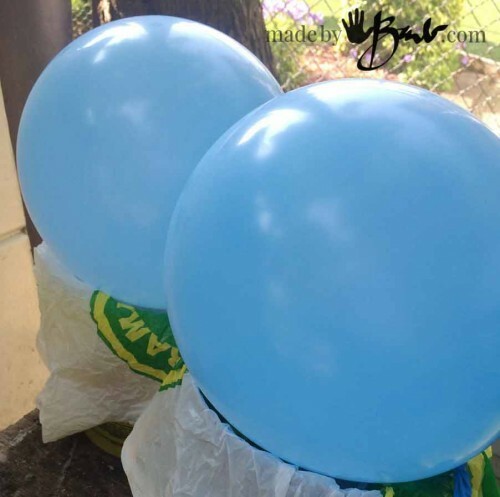 The balloons were easy to pop, where as the beach ball needed some manipulation to deflate. If you aren’t cheap you could just sacrifice it and cut it. I decided to do the more difficult deflation. There will be some of the thin “extra” concrete in the spaces, but that usually chips off easily with any tool. It is quite rustic looking anyways, so it isn’t fussy. In the design sense, larger simple forms are best. 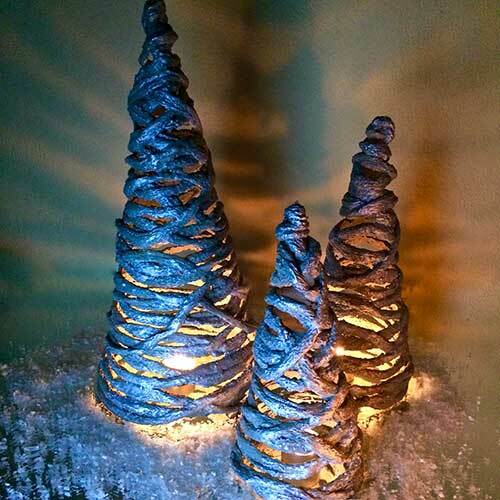 Imagine these in a minimalist garden, perhaps even filled with light strings at Christmas. AND the bonus, is that they will withstand the elements, and be able to stay in the garden. AND you will be able to say: I made them! One can never have too much concrete… I just need more time and a longer summer here in Canada! Thanks! I love all your concrete projects. I was happy to see you watermarked your photos as that is how I was able to find your tutorial. Some other site had your pics but did not link back to this tutorial. Yes, I love concrete. It has so many possibilities, has longevity and inexpensive. I’m dreaming of some new ones already and we are still quite frozen up here. Sometimes people ‘pin’ an image but not a site. Glad you found me, check back often or subscribe. 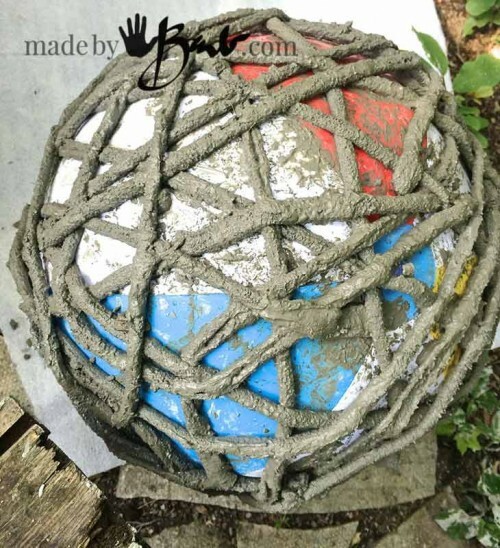 Love, love, love your Concrete Garden Orb! Hope it’s not too late to ask a question. Was the polar fleece that you used polyester or natural? I’ve been playing around with cement dipped and draped fabrics for a couple of years now and haven’t had much luck when using polyester fabrics. Whatever you used, Barb, your Orb is amazing! Thanks. Hi Eva! Glad you liked it! Those orbs are just waiting to go back to their places in the garden after being snowmen. The idea is to have some fuzziness to grab the concrete. It will take a fair bit of squishing and mixing to get it into the fibers. Dollar stores usually have those big chunky yarns. My Concrete Spook is polyester fleece too! Thanks so much for taking the time to provide your very helpful answer “My thought is that they are the ‘rebar’ that reinforces the concrete”– I like your way of thinking about polyester fabric. This makes a lot of sense to me. Both your snowman and Concrete Spook are terrific, Barb…very creative! And I appreciate your link to the fuzzy yarn too. Thanks again and have fun creating. P.S. Have you tried doilies dipped in cement to make bowls and vases? I made a cement tablecloth using an old stained lace tablecloth.,,messy fun. Oh, you are welcome! I have not the doilies. I have tried just the wash cloths dipped in concrete. I have still to finish them. I tend to want ‘re-design’ ideas to make them my own. I guess it’s the designer in me. And I think readers appreciate original content. But having said that… the internet is a weird place. 2 minutes later someone will call it their own. 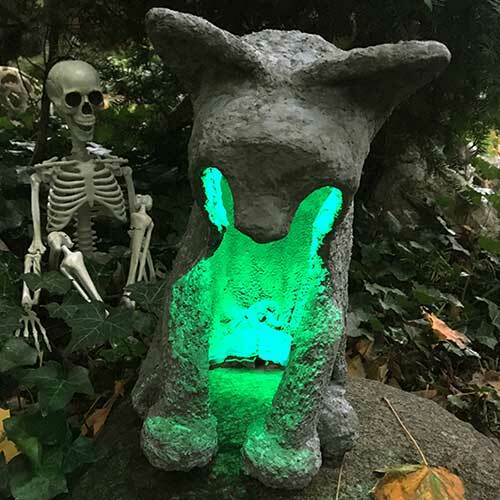 Hi Barb, Oh wow, fantastic orb thank you so much for sharing, I’m just starting out gardening again after many years and want to make a quirky garden with lots of hand made curios. I will definitely be filling my garden with many different sizes of them. I have quite a few old towels that I was wondering what to do with? Now I know, I should imagine they’ll be good at absorbing the cement! And thank you also for the recipe for making a latex mold, brilliant!!! OOOH! You could make a cute snowman by using graduating size orbs! Love this idea! These look so wonderful! At the next thrift store or yard sale I need to keep my eyes open for some old polar fleece fabric blankets or clothing for some cement fun. I love this idea. Do you think that I could add color? If so how would I do it? 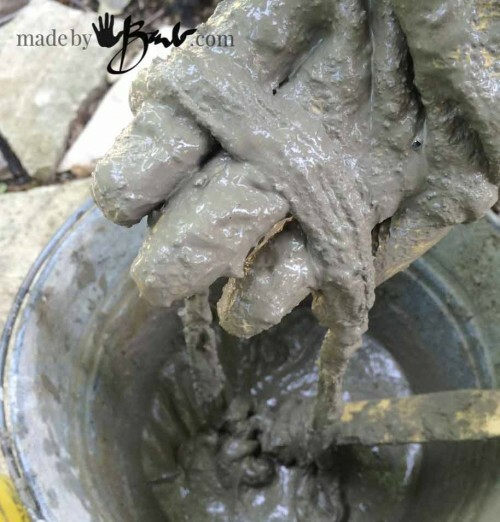 There are dyes that are available for concrete in earth tones. You could add a bit of acrylic paint but not too much as then it will affect the integrity of the concrete chemistry. Maybe just use some accenting after making as I stated in the above comment. Metallics work well with concrete! First REALLY great idea of seen in a long time. I think it was Thomas Edison that tried to make cement furniture . You have IMPROVED on a a genius ‘s idea !!! What do you think about painting them ? I have a tiny ,tiny yard and it could look really tacky. Have you ever tried using old tee shirts for the balls? Love all that you do for all of e folks that like concret art. I think you mean to use as the strips for the dipping? No, I tend to use fabric/fibre that can absorb enough cement it make it strong. I’m considering doing this for my daughter’s gift card “box” at her wedding. I’m having white yarn orbs on the tables and in lanterns and thought this would be a substitution for the card box. I’d make it into a snowman with this as the base. (So if someone wants to steal the cards at the reception it would be noticeable and difficult.) How heavy is this? I’m kind of known to do something unique for the card box and this certainly could be it! They are not crazy heavy, but not too light either. Easy to move around. Depending on the amount of ‘wraps’ it can be more dense or light. 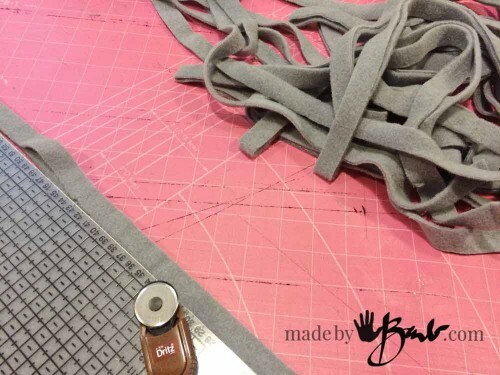 The choice of yarn can also make a difference it the thickness. See my trees as well. Good luck, always great to be able to say ‘I made that’! Thank you. Should there have been photos to go with the narrative in the “Orb tutorial “? Looks very interesting & can’t wait to try it for my Australian garden ! Oh, yes there should be lots of photos to make the orbs I have many orbs on my site Enjoy!